Thunderflower has received recognition with an award for Thunderflower Gin at the International Spirits Challenge (ISC) 2019, regarded as one of the most respected and sought after awards in the drinks industry. Following a rigorous blind tasting of over 1700 spirits by an expert panel of specialist judges, Thunderflower Gin beat off well-known brands from around the world to win a Silver Medal in the London Gin Premium category. “This is the drink sector’s most respected award for Gin,” says distiller Dominic O’Nions, ‘and as we are probably the smallest distillery in the competition it is a huge achievement for Thunderflower and puts us in the same space as some of the top gin brands in the world - we’re thrilled’. Thunderflower Gin is a small-batch, craft gin made in the London Dry Gin style using a traditional ‘one-shot’ distillation method to extract the flavour from eleven botanicals via vapour infusion only with the only addition to the spirit being spring water. 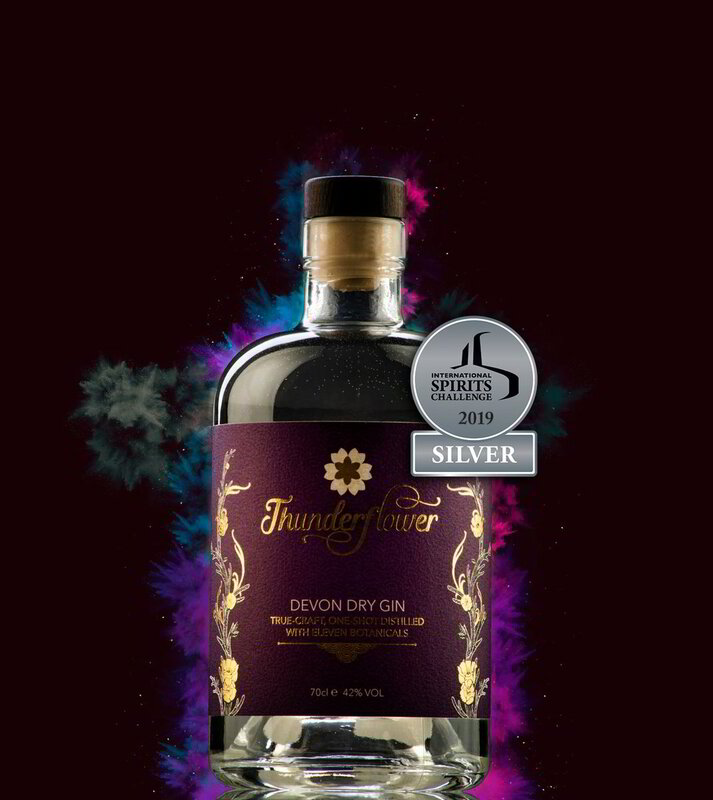 The name Thunderflower comes from an old Devon legend that says that the tiny white 'thunderflowers' that sometimes grow on the thatched cottage roofs around this ancient landscape, can ward off both lightning and witchcraft which owners Anicca & Dominic O’Nions thought were admirable qualities for a gin. Launched in early 2018 the gin has been attracting attention for its bold, complex flavour profile, and was recently awarded another Gold medal at the Taste of the West Awards 2019 following a gold medal in the previous year. Welcome to Thunderflower News. Subscribe below to receive occasional news and updates. Thunderflower Ltd is a company registered in England & Wales with company no. 07615371. VAT No. 302859310. © 2018. Thunderflower Ltd, 60 Higher Brimley Road, Teignmouth, Devon TQ14 8JU.